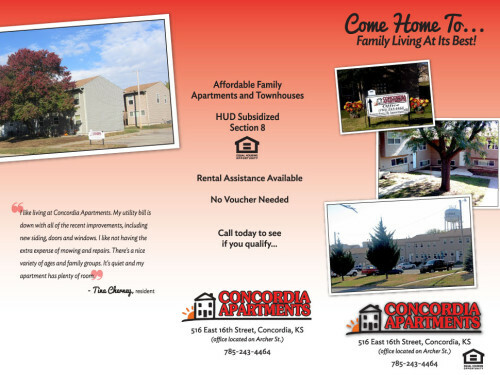 Concordia Apartments is an inviting housing community in beautiful rural North Central Kansas. Situated high on one of the areas gently rolling hills we have an enchanting view of the Republican River Valley. We offer 1, 2 and 3 bedroom updated, well maintained units with expansive, landscaped lawns in a warm and welcoming small town environment. Concordia offers many things to do no matter your interests: For the nature lover — go a few blocks and take a stroll down a lovely country road. The river on the north side of town offers a refreshing respite on a hot summer day, bring a fishing pole and have catfish for supper! Enjoy one of our two newly updated city parks, one is just three blocks from Concordia Apartments and the other houses a great pool. For history buffs — tour the historic Brown Grand Theater, Orphan Train Complex, WWII POW camp, the Nazareth Convent and Academy or learn about all of them at the Cloud County Historical Museum. Or, you could always take a history class at Cloud County Community College. For the sports enthusiast — take in a high octane Concordia Panthers or CCCC T-Birds game. 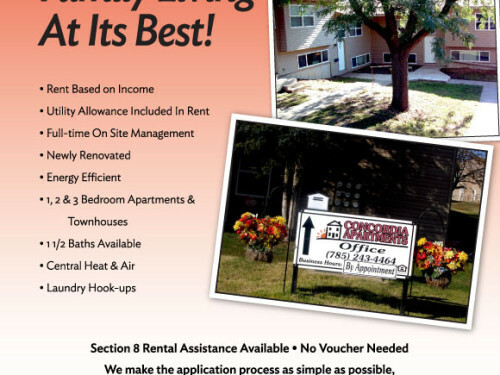 We also boast a nine hole golf course and an extensive Parks and Rec program. Concordia is a charming small town; conveniences such as our Super Wal Mart, public library, gas stations, restaurants and four screen movie theater are all only minutes away. 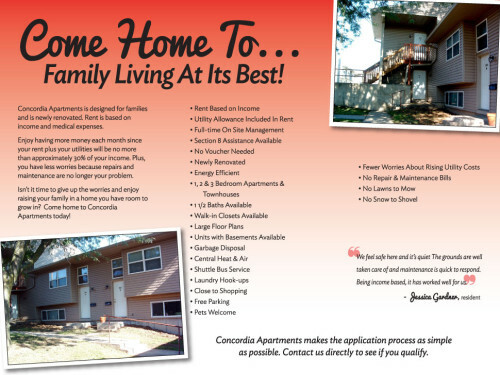 If your ideal is peaceful country living combined with a fun and happening small town then Concordia is the place for you — let us at Concordia Apartments welcome you home!